Everything about this absolutely intrigued me. So when I saw a picture of this on Pinterest, I knew I had to try it. I also know better than to follow a recipe on Pinterest (although maybe I should start giving SOME of them a try again…) so I made up this recipe as I went along based upon the pictorial concept. Fun times. It’s actually a really easy concept. You make lasagna, in a bowl, without sauce, with the idea that once it’s done baking, you flip it out onto a plate and you cut it like a pie. I learned a couple of lessons while making this, but I really liked making it, I’ll definitely do it again. Not only did it look beautiful, but it tasted FANTASTIC! Since you add your own sauce in the end, you can control how soggy your noodles get (and maybe some of us just don’t like as much sauce…just saying). First spray your bowl. Make sure your bowl can go into the oven!! I used a medium-sized Pyrex (thanks mom!). 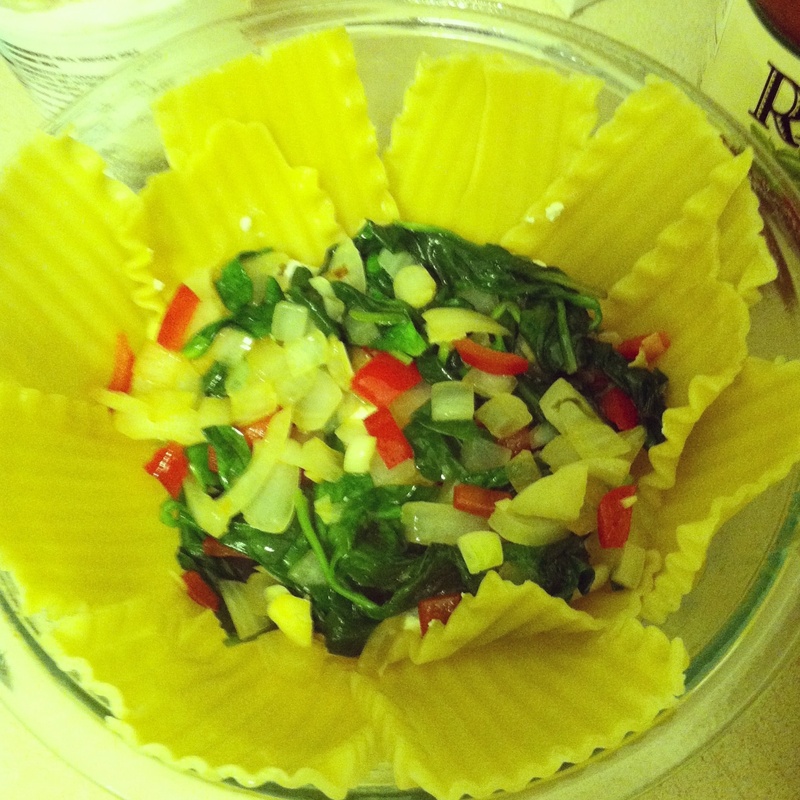 Cook your lasagna noodles and set aside. I found it was easiest to lay them flat and not touching once cooked so they didn’t stick. There was probably a better way to do it than I did, but, it worked out, so I’m happy. 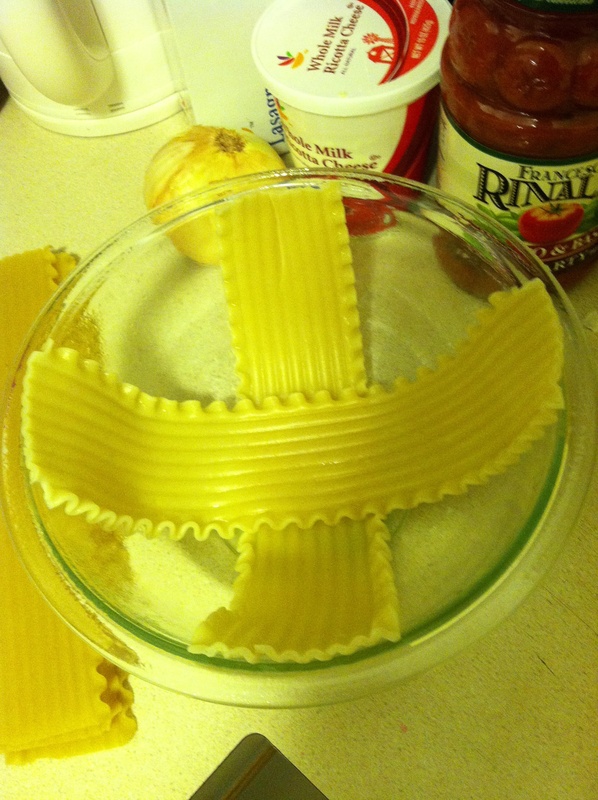 You want to place your noodles around the bowl in a cross-cross fashion so that you have no open space, only noodles for your pie ‘insides’ to stick to. This is a really fun way to involve your child. Explain to your kid about the notion of criss-crossing, and then have them try it! I then added another layer of noodles. Start your meat. I added the tomatoes to my meat just because that happens to be what I like. Feel free to omit OR to add something else! I season the meat with a bit of steak seasoning from Atlantic Spice Company. When meat was cooked through I moved to a bowl. Okay, back to building your pie. On top of your layer of noodles, I spread a layer of mozzarella cheese and then a layer of meat mixture. I then topped with noodles and did another ricotta veggie layer. I then added another layer of noodles to seal it and baked in a 350 F oven for 20 minutes (remember, everything is cooked! When finished cooking, take out of the oven and carefully place a plate on top of the bowl and flip out. I cut into the pie right away which resulted in some sagging…when we went back for seconds, it was MUCH easier to cut, so I recommend waiting about 5 minutes for everything to set. Top with sauce. I added all the leftover meat and veggies to the sauce and we added as much or as little sauce as we wanted. Success! A little saggy looking, but it held up really well this morning when hubby went to take it for lunch! Another lesson learned…the top layer of noodles was VERY crunchy. I think next time I will try omitting this step and having a thick cheese layer as the top so that when you flip the cheese is on the bottom Probably a mozzarella parmesan mixture.